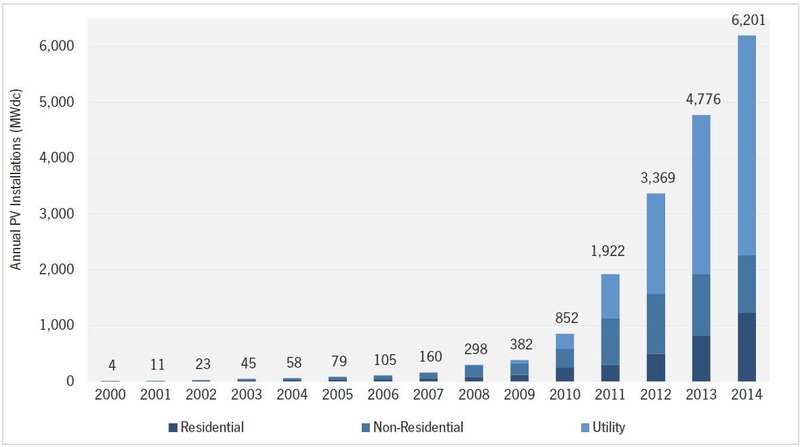 GTM Research and the Solar Energy Industries Association have released their US Solar Market Insight, 2014 Year-in-Review report, and it was “another banner year” for the US solar PV industry, installing 6,021 MW of new capacity in 2014. Installations were 30% up on 2013’s figures, “and more than 12 times the amount installed five years earlier,” GTM Research and SEIA wrote in their report, bringing the country’s cumulative PV total to 18.3 GW of solar PV, with another 2.2 GW of concentrating solar power (CSP). 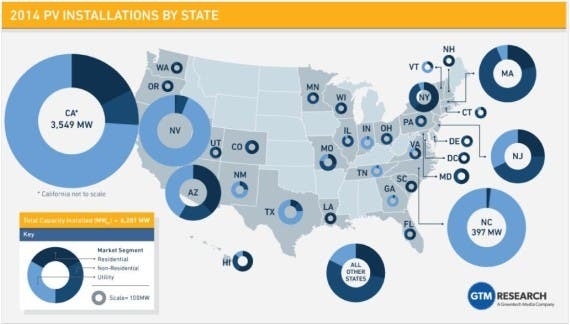 Specifically, over 600,000 homes and businesses in the US are now running on-site solar, with nearly 200,000 of these being completed in 2014, and six US states are each home to more than 500 MW of operating solar capacity. Further to solar’s increase in the US, each year it has continued to grow as one of the major generators of new electricity. In 2014, solar accounted for 32% of all new electricity generation capacity in the US, second only to natural gas. It was also #2 in 2013, when it provided 29% of all new electricity generation capacity. The authors of the report highlight three “fundamental drivers” that they believe are responsible for “solar’s continued growth in the US.” Those are: Falling costs; downstream innovation and expansion; and stable policy and regulation. 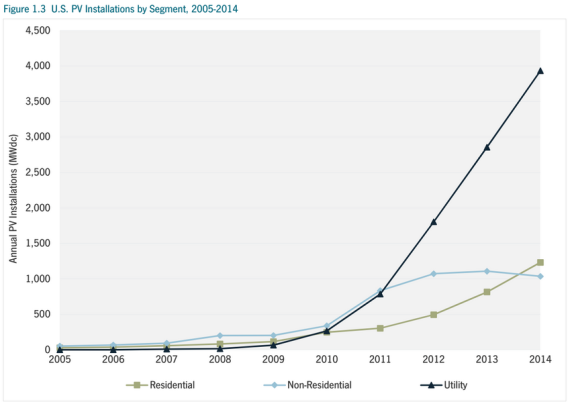 Subsequently, the authors of the report see several key themes to watch in 2015 if the US solar PV industry is to have another “banner year.” These include potential residential rate structure revisions; whether or not commercial solar will make a comeback, in the face of residential solar’s immense success; and whether or not the “enormous utility-scale solar pipeline comes to fruition,” with more than 14 GW of utility-scale solar projects in the US expected to be completed in 2015–2016. California again dominated the installations, ranking first since 2012, when it installed 1,046 MW. It then installed 2,621 MW in 2013, and grew again to 3,549 MW in 2014. California is now home to 8.7 GW of solar PV, but it’s not the only one making massive gains now. In fact, 20 states soared past the 100 MW mark for cumulative operating solar PV by the end of 2014. North Carolina ranked second for installation capacity in 2014, after starting at sixth in 2012 and growing to third in 2013. The state installed 397 MW in 2014. 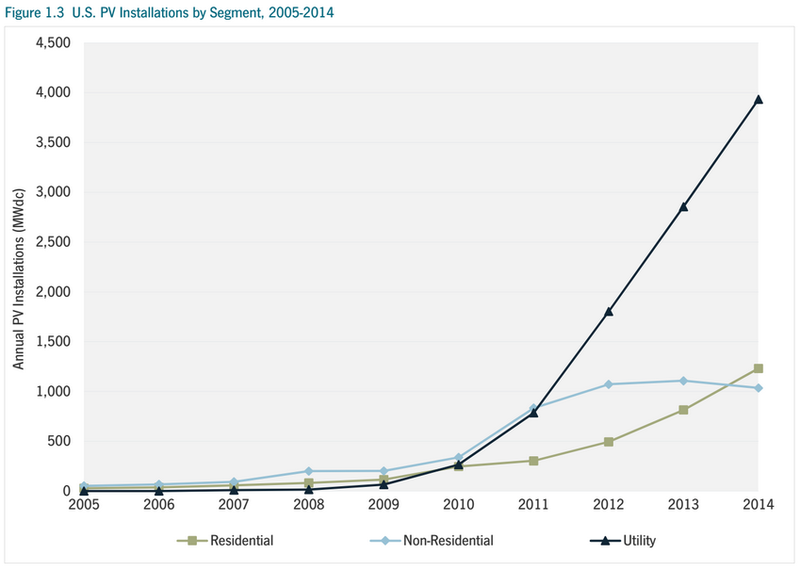 The authors of the report predict that PV installations will reach 8.1 GW in 2015, up 59% over 2014, with growth in all segments, but most prominently in the residential solar PV market.